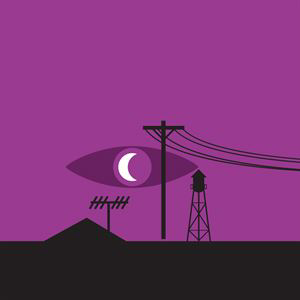 For those unfamiliar with it, Welcome to Night Vale is a podcast written by Joseph Fink and Jeffrey Cranor, starring Cecil Baldwin as Cecil Palmer, the voice of Night Vale’s community radio show. Night Vale is a scenic little desert community where all of the weird things that have ever happened. Think the love child of X Files and Radio 4. A world of forbidden dog parks, hooded figures, floating cats, and mysterious lights in the sky (mostly void, partially stars). In a way completely inexplicable but makes perfect sense upon listening. The show began in 2012 and releases twice a month, alongside numerous live performances, books and of course various merchandise. It’s a very ‘Millennial’ experience- released into the wild for free, crowdfunded and supported by a loyal and growing audience. But it also marks a success story of that very ‘Millennial’ approach to doing things. I confess I’ve not listened to Night Vale in probably a year. Nothing to do with their work I am just not a podcast person. I think my dyslexia makes listening to spoken word difficult if I’m trying to do anyting else, and I rarely have time to sit and simply listen. So through no fault of their own Night Vale had fallen off my radar. But actually coming to the live show fresh, was a real advantage and treat. The beauty of a radio show of course is that you don’t have to ‘perform’ it and if it goes wrong, you can re-record. So there’s a little worry that this won’t translate to ‘live’ performance. 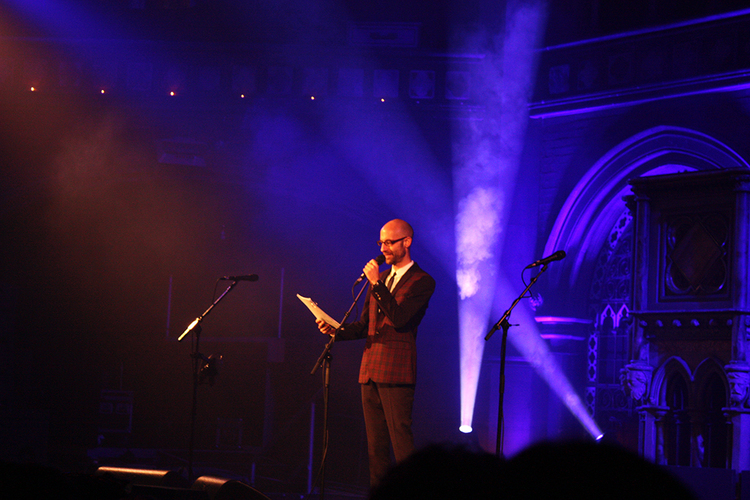 But Night Vale know how to pitch their work- they don’t over-perform or try and inject a ‘stagey’ element to it. It’s as if you were watching them record the podcast, which is exactly the right way to pitch it. The show includes a musical element (The Weather on a Night Vale broadcast is always a musical guest, again it makes sense if you hear it) and on this tour it was the brilliant Erin McKeown. A great mix of soft-rock love songs and political anthems. McKeown worked the crowd well, sensing a Welsh crowd enjoys a sing-along got everyone involved. I highly recommend seeking out her music as well, particularly those fond of Queer love songs and anti-Trump anthems (I strongly suspect those categories overlap somewhat). Her song ‘The Queer Gospel’ is the actual ‘weather’ segment in the middle of the show and is the perfect addition to the world of Night Vale. It is difficult to explain or review Welcome to Night Vale. It is very much a ‘cult following’ and the demographic- Millennials with interesting hair- are devoted. It also feels like a welcoming audience, the kind of crowd you look around and figure if you were on your own, you could find someone to chat to at the bar based on their cool T Shirt or a pin badge on their bag. And that nerd-space experience is as much a part of what Night Vale offer their audiences as much as the performance itself. Being a bit out of the loop with happenings in the Vale I worried I’d feel left out. And while there were a few jokes that no doubt passed me by, it really doesn’t matter as Night Vale is a world weird enough that you can dip in and out of at any time. There does seem to be a fair bit of fan-service going on in the live shows, which is to be expected and doesn’t detract from the excellent writing and overall is a fun experience in which you’re carried away by the fan’s excitement and enthusiasm. Though, being a slightly grumpy person in this respect, I could have lived without the amount of audience interaction in this show. Amid the strange comings and goings of the town that are par for the course, this show ‘All Hail’ also had a strong message at its core. Based around the town’s blind worship of the now infamous ‘glow cloud’ there was at its heart a message against blind following and an invocation to action. It’s not a subtle message by any means, but it doesn’t have to be, and in the world we live in maybe it shouldn’t be. The performers, are as brilliant live as they are in the recording. They include Meg Bashwiner as our compare and Haze-cloud Deb and others that are best left as a surprise on the night. But at it’s heart of course is voice of Night Vale Ceil Baldwin. As funny, engaging and with a voice that could sooth Tigers or politicians, Ceil really does embody Night Vale. He spins the narrative with such ease (well except when he nearly sent a microphone flying) and weaves together the strange world with such nonchalance you’d think the was reading the weather for real. It’s a sweet and funny performance and he clearly relishes the audience reactions. He’s funny, engaging and brings a real heart to this sweeping and surreal world. 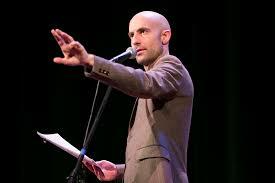 Night Vale is big on a sense of activism under the weirdness. It’s an inclusive, LGBTQ supportive, and political group of people. And that comes through in the writing. And good for them. Not only does it create work with a message, but it brings people together on that message. It’s full of Queer performers and people of colour and although they don’t name names in the fictional world the trajectory of the statements is clear. But at its heart it’s sweet and hopeful and inclusive and kind. And you know what, that’s kind of lovely.